I would like to tell you today the story of the Taj Mahal, the Taj Mahal, as I saw it, and felt it. It was raining that morning and the fog was floating in the air, omnipresent. 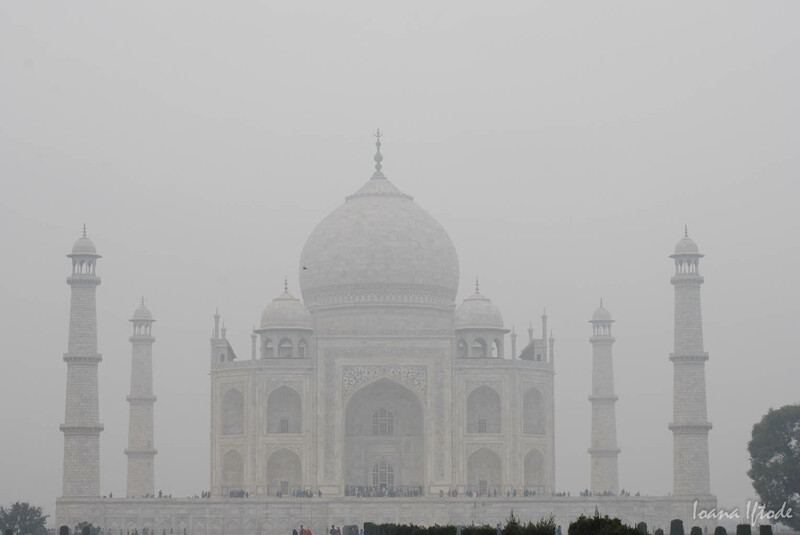 Passing the second gate, the Taj Mahal appeared in front of my eyes as the silhouette of a white, gloomy ghost. We got closer, stepping forward to meet this mighty legend, the Taj Mahal that everyone speaks of, that every visitor builds up in praise. Slowly I approached, looking with curiosity at its white marble, at the great four towers surrounding it, at the subtle, everlasting flowers carved into the stone, at the clouds that seemed to be crowns on top of the towers, letting just a little bit of sun to come out, just enough to light up in fire details of the inlaid work of gold and precious stones. In front of the Taj Mahal, one takes a step back. A step back into the very core of his being, into that place deep inside of us where grace and beauty dwells. Marvelous works of art, or stunning sights in nature, have the capacity to do that. Maybe it’s because we feel that, in that moment, grace is flowing in us. Maybe because we can feel then a glimpse of the beyond, of the ever-perfect, of the beautiful without effort, right there, in front of our eyes. On one of the following days we visited Agra and its mighty fort – still in the company of the rain and the fog. But this time, we were also in the (much more enjoyable!) company of Julie and Olivier, a French couple we met in Rajastan, and with whom we shared stories of places, and people, and our home countries. This entry was posted in Discovering, India, Meditative, Places and tagged india, Taj Mahal by Ioana Iftode. Bookmark the permalink.